It’s January 18, a little less than half an hour before the Clippers are set to tip off against Dallas at Staples Center. From each corner of the downtown L.A. arena, smoke machines funnel into small fans. There’s a faint cloud hovering over the court. It feels like a low-budget rock concert before the lights have gone down. At game’s end, the announced attendance will be 19,252 — another sellout — but as both teams go through pregame warm-ups, the lower bowl is lined with stretches of unfilled seats. The first row behind the baseline is empty, and throughout the section, pieces of paper have been taped to seat backs: Next time, pay a much lower price for these great seats. Season ticket packages for 2012-2013 now available. Since David Stern’s decision to steer Chris Paul away from the Lakers but not away from Staples, the conversation around Los Angeles and the NBA has been about the converging paths of this city’s franchises. As the aging Lakers appear on their way out of the NBA title conversation, the Clippers have begun their ascent — the 2011-12 “Rise Up” slogan stamped on banners around the building becoming rather fitting. As of tonight, the results have mirrored those thoughts. Four days prior, the Clippers beat the Lakers 102-94 — despite 42 points from Kobe Bryant. For all the talk of how the hierarchy of basketball in Los Angeles is changing, there is still a sizable gap in the stronghold each franchise has among Angelenos. A week earlier, the local ratings for a Lakers-Jazz game were more than 60 percent higher than those for Clippers-Heat. As part of a short swing out west, the Mavericks are in town to play both teams over the course of three days, and over those two nights, the differences at Staples are enough to show how much further the Clippers have to go. It starts high in the rafters, where 16 yellow banners hang in the dark. On either side, two gray sections of concrete feature projections of the Clippers logo. Two nights earlier, with the banners lit, the logos were gone, and if you didn’t know any better, you’d never know two franchises called this place home. Two hours before the Lakers’ Monday-night game, the empty arena helps show off how fundamentally similar the two setups are. The seating for each team is almost identical. The capacity for each team hovers around 19,000, with the main difference coming in the alignment of seats around the floor. The Clippers have two rows of seats along the baseline, while the Lakers have one surrounding the entire court. Everything about a Lakers game at Staples is designed to promote the feeling of an exclusive event. Nowhere is that more apparent than in the lighting. As Pau Gasol goes through his pregame shootaround, the floor is already lit like a stage. While the Clippers use a larger set of lights that shine on the entire arena, the Lakers have thin strips of lights focused on only the court. The effect isn’t cheap, reportedly costing about $2 million, but the result is pure Showtime. The crowd begins to fill in. Entertainment Tonight cameras trail Khloe Kardashian and Kris Jenner to their seats, which aren’t even courtside. Those who have managed to secure seats on the floor include LL Cool J, Don Cheadle, George Lopez and — of course — Jack Nicholson. The Kardashians will be back two nights later when the Mavericks and Khloe’s husband, Lamar Odom, take on the Clippers, but the cameras will be absent, and the most recognizable face joining them courtside will be the guy who’s always bringing bad news in the Final Destination trailers. The not-so-famous segment of the courtside Lakers crowd carries its own weight. The faces that I can’t recognize still feel like somebody. Even those who are dressed down are in sneakers that clearly cost more than my couch. The air of a Clippers game skews more toward accessibility, and a scan of the crowd as the teams warm up has the look of a family night out. Dancing kids dominate the JumboTron. Chris Tucker is replaced with a man whose daughter is seated on his shoulders as he snaps pictures. The Clips haven’t been without celebrity faces this season — Rihanna has been at a handful of games — but on these two nights, the Lakers game is still the place to be seen. With about two minutes left on the Lakers’ pregame clock, a video comes onto the JumboTron and Chick Hearn’s voice blares over the speakers. The next few minutes are filled with famous faces and moments: Mikan, West, Abdul-Jabbar, Worthy, Baylor, O’Neal, Johnson. The Clippers have a video, too, and it contains not a single moment before 2010. The pregame introductions continue this feel of the old versus the new. A few minutes before the lights go down for the Lakers, the crowd watches a series of classic Los Angeles shots, over a backdrop of “I Love L.A.” After the opposing team’s starting lineup is announced, the lights go dark, and a circular white curtain drops from the JumboTron to the floor. A short video is projected onto the curtain, and when it falls, the crowd is reminded that this is the franchise with 16 world championships, and “Baba O’Riley” kicks in. The Clippers trade in The Who for an original song that I can only assume is called “Get Loud, Everybody,” after the instruction is repeated over and over. The white curtain is replaced with green lasers that cut through the smoke that has been gathering for the past couple hours. 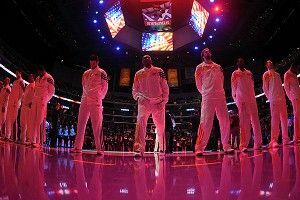 If the Lakers are a Broadway show, the Clippers are a KISS concert. The Clippers, like many NBA teams, have what seem like game atmosphere coordinators, a trio of microphone-toting personalities who never let the entertainment stop. Just about every timeout features a sponsored game or logo-ed outfit for the Clippers Spirit dance team — HotelPlanner.com musical chairs, Mandalay Bay T-shirts (“You’re not a tourist, you’re a resortist”), the Chumash Casino shooting game. Once a game, the spirit squad introduces its MVP fan of the game, a longtime (or sometimes short-time) season-ticket holder, an ode to those who have dedicated themselves to the franchise. On this night, it’s Luis Jimenez, who’s had his tickets since 2005. Because of how quickly things have changed, it’s easy to forget that even in Los Angeles, the Clippers operate like a small-market team struggling for a foothold. The games are similarly ugly. Coming off four straight games of 40 or more, Bryant does his best to shoot the Lakers out of it by going 7-of-22. The seven third-quarter points for Los Angeles is good for the second-lowest quarter total since the NBA-ABA merger, and Dallas does its best to add to the fun by going 4-of-26 from 3-point range. The Clippers are without Paul, who is sitting with a left hamstring strain, and despite Mo Williams’ 26 points, it’s clear how lost the team is on offense without its new point guard. Chauncey Billups leads the team with 19 shots, and the ball movement moves between stagnant and nonexistent. But equally bad play from the Mavs keep both teams in each game, and with nine seconds left, the Lakers have the ball with the game tied at 70. As two Dallas defenders moved toward Bryant, he swings the ball to Derek Fisher, who buries a 3 with 3.3 seconds left, and with that, the purple-and-gold crowd erupts for one of the few times all night. Two nights later, the situation is almost identical. Except now, with five seconds remaining, the Clippers are down by one, and it’s their star (Blake Griffin) finding a different aging point guard behind the arc. With a little more than a second remaining, Billups hits a 3, and the reaction from the crowd is indecipherable. A completely packed Staples Center explodes, and for the second time in three nights, a fanbase completely invested in its team on the floor is rewarded with another win.